These days, almost everyone has a smartphone. But have you ever wondered if your phone can do more than you realize? Consumer Reports recently highlighted 21 ways to make your smartphone more efficient. Some of those features, tucked away in your phone’s settings, including reading text on a screen and making tiny words easier to see. And forget custom ring tones — some phones allow you to create custom text vibrations for each person in your contact list. Here are five of those tips, along with steps for accessing the features on iPhone and Android phones. These tips will work on most recent smartphones, though Android models and brands can vary. 1) Listen to text messages, emails and articles. If you want to give your eyes a break — or you just prefer listening to content over reading it — that’s an option on most smartphones. You can enable a phone to read texts, emails and website content out loud. On iPhones: Go to Settings —> General —> Accessibility —> Speech —> Speak Screen. Once enabled, swipe down with two fingers from the top of the screen to hear content. On Androids: Go to Settings —> Accessibility —> Select to Speak. Tap the person icon and the phone will begin reading. 2) Increase text and screen size. Instead of constantly zooming in, you can set your phone’s font and display sizes to be larger. On iPhones: For text size, go to Settings —> Display & Brightness —> Text Size. For screen and icon size, go to Settings —> General —> Accessibility —> Zoom. On Androids: For text size, go to Settings —> Display —> Advanced —> Font Size. For screen size, go to Settings —> Display Size and click the +. 3) Read small text using your phone’s camera. No more squinting: Transform the camera on your phone into a magnifying glass to make it easier to read small print on forms, labels and documents. On iPhones: Go to Settings —> General —> Accessibility —> Magnifier. Open the camera app and use the Side button to activate. On older models, triple click the Home button to activate. On Androids: Go to Settings —> Accessibility —> Magnification. Open the camera app and tap the screen three times to activate. 4) Know who’s texting you with custom vibrations. If you usually leave your phone on silent but want to know when your mom or a close friend texts you, you can create a custom vibration specifically for their texts. This feature is available on iPhones, but Android users must download a separate third-party app. On iPhones: Go to Settings —> Sounds & Haptics —> Text Tone —> Vibration —> Create New Vibration. Hold your finger down to create a pattern and release it to pause. Save the custom vibration. To assign it to one of your contacts, open your contact book and find their profile. Then go to Edit —> Text Tone —> Vibration. 5) Delete typos with a quick shake. If you’re in the middle of an email or text message and write a dreaded typo, delete it quickly by shaking your iPhone. You can also undo a deletion by giving the phone another shake. This feature is not available on Android phones. On iPhones: Go to Settings —> General —> Accessibility —> Shake to Undo. 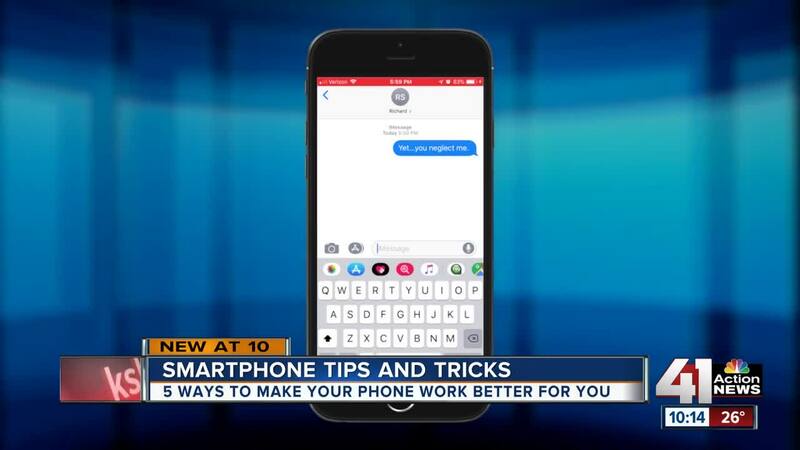 For 16 more tips and tricks to make your smartphone work better for you, read the full Consumer Reports article here.